yourPrint lets you create your own T-Shirts online within seconds. Customize your T-Shirts with your Images, Text, Design or Logo. The printing is done in high quality, directly on the surface of the garment. This gives it a life like print. 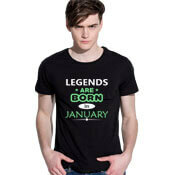 Personalized Clothing is a new concept which is being pioneered by yourPrint in India. The T-shirts have numerous variants - like colors, designs, patterns etc. All the variants are available for males, females and kids. We also have couple T-Shirts. We have T-Shirts for everyone, and the best part is that they are design by You! yourPrint lets you design your own clothing and stand out in the crowd by being unique and different. T-Shirts are available for Men, Women, Couples & more. All T-Shirts have high quality print on them. The T-Shirts are made up of Cotton and are breathable and soft, making them comfortable to wear at any time of the day. The T-shirts are basic round Neck Tees which are printed with the design of your choice. Customized Tees for all sizes are available at yourPrint. We ship to all cities in India - including Bangalore, Mumbai, Hyderabad, Delhi, Kolkata, Pune, Panipat, Haryana, Maharashtra and all other towns, cities and states. The T-shirts are well packed before shipping using the best e commerce practices to ensure that the Printed T Shirts reach you in the best condition. yourPrint's wide range of custom printed T-Shirts are perfect for all occasions - be it a formal occasion like Office Meeting or Interview or a casual occasion like a party, festival or gathering with friends or family. Our custom printed tees offer the best style quotient and best quality at the lowest price in the market. All the Tees are easily customizable with your photos, text, quotes and more.